Christmas is my favourite time of the year and it is one of my favourite times to bake loads of quick and easy treats for friends and family. Yesterday I was baking so much and ended up with five amazing quick and easy Christmas treats; which I will be uploading the recipes for over the weekend. These are all so yummy and they look amazing. I made all of these for friends and my Mum's work colleagues and they thought they were all bought from a shop. So if you want something quick to make with your children over the holidays that people will be impressed with, then these recipes are for you. Chocolate bark is probably the easiest thing to make and you don't have to bake anything. 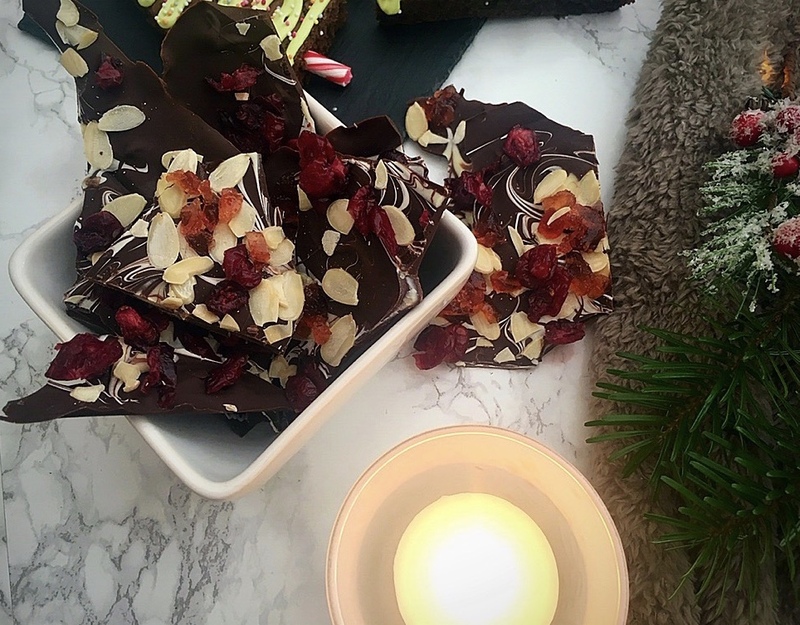 I am going to show you how to make the chocolate bark that I made, but you can add any toppings to this chocolate bark; including marshmallows, caramel pieces, dried fruit, glace cherries, nuts, salt or anything you want to put on top of your chocolate bark. The only piece of technical equipment you will need is a microwave to melt some chocolate. This would be great to make with children as you don't have to worry about them being near an oven and they make really sweet Christmas presents! Firstly, line a deep baking tray with greaseproof paper and place to the side. In two separate bowls, break up the dark chocolate (or milk chocolate) and place into one bowl and then in the other bowl break up the white chocolate and place in the other bowl. Melt the chocolate in the microwave (remember to keep stirring after every 30 seconds). Once the chocolate has melted pour all of the dark chocolate onto the lined baking tray and spread out with a spatula or spoon so it is quite thin. Then with a small teaspoon, dollop some white chocolate on top of the dark chocolate. With a toothpick start swirling the white chocolate and dark chocolate together, so you get a beautiful swirled/marble effect. While the chocolate is cooling, add all of your toppings. I put flaked almonds, chopped glace cherries and dried cranberries on top of my chocolate. Leave to fully cool for 10 minutes and then place in the fridge for another 20-30 minutes. Once it has set fully, take out of the fridge and remove the chocolate from the greaseproof paper; if it has not set then place back in the fridge for another 20-30 minutes. Then break the chocolate into large chunks (so it looks like shards or bark) and then serve. You can wrap some pieces in cellophane and tie with a ribbon and give them as presents for friends, family members, work colleagues or teachers. You can add any toppings to this chocolate bark. I have made rocky road where I put mini marshmallows, chopped glace cherries and crushed biscuits on top; which would be perfect for children. You can really add anything to this chocolate or leave it plain with the white chocolate marble effect. This is so easy to make and all your friends will be impressed that you have made your own chocolate bark!